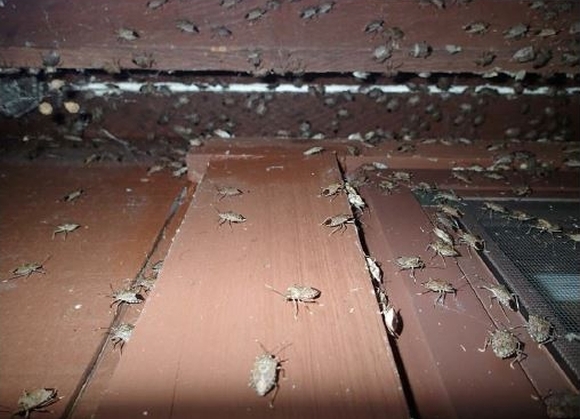 It’s the high risk time of year for the brown marmorated stink bug (Halyomorpha halys) to make a break for New Zealand. 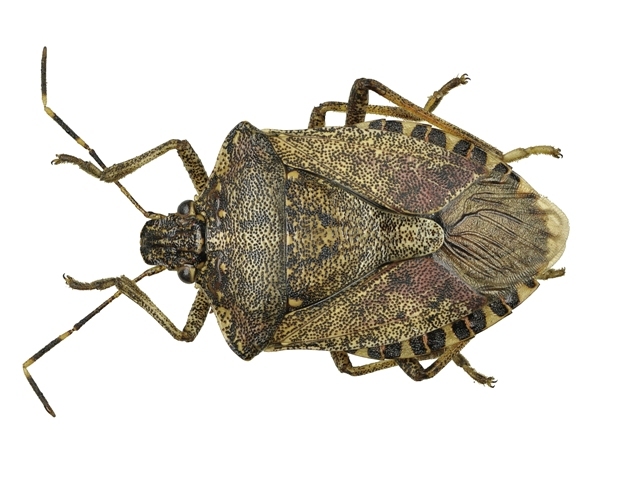 This stink bug is a hitchhiker pest, a voracious feeder and an imminent threat to New Zealand’s environment and economy. Despite being routinely detected and dealt to at the border over the past four years, this bug is not established in New Zealand and we need to keep it that way. From October onwards, the brown marmorated stink bug begins its winter behaviour in the northern hemisphere. It aggregates en masse then hides in nooks and crevices. This behaviour makes them easily transported by unwitting traders and travellers – the bugs squeeze into tiny hard-to-see spaces, such as between the corrugated bits in a piece of cardboard. It’s thought the USA invasion of this bug in the mid 1990s occurred from just one egg mass slipping in. Adults are approximately 1.7 centimetres long, with a distinctive brown shield shape. Their underside is white/tan, the legs and antennae are brown with white banding. Eggs are light green, barrel shaped, and found in clusters of 20–30 eggs. These eggs are laid on the underside of leaves. 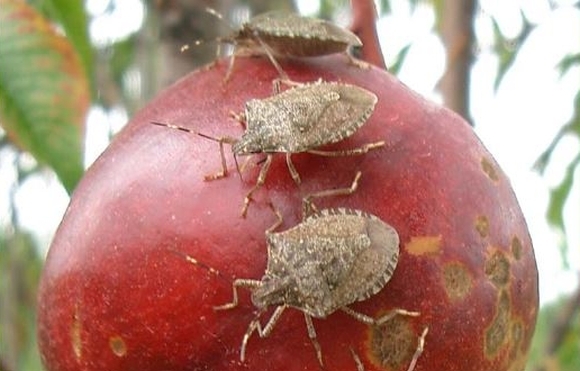 The Ministry of Primary Industries has a fact sheet outlining the key characteristics of the brown marmorated stink bug, and its size and appearance in comparison to other stink bugs in New Zealand. This stink bug feeds on a huge variety of plants. We don’t know to what extent it will affect native plants, because to our knowledge hasn’t been exposed to our plants before. But the bug’s menu includes plants related to many of ours. The New Zealand horticulture industry currently lists it as one of the top six pests of concern globally. The bug presents a massive public nuisance as it collects indoors in large numbers over winter. It gives off an odour when disturbed or crushed, leaving a long-lasting offensive stink. The bugs’ appetite for different kinds of plants represents a huge threat to New Zealand’s flora. The sheer range of plants they eat is unusual – usually a bug’s diet is confined to one taxonomic family, genus or species. But it looks like this bug could eat plants across 29 families native to New Zealand. If this turns out to be the case these bugs may represent a huge threat to our flora. To put this into perspective, the great white butterfly incursion that DOC is attempting to eradicate in Nelson/Tasman affects just one plant family that contains about 75 species; the brown marmorated stink bug could potentially affect 29 families which equates to about 1600 species! This stink bug is native to China, Japan, Korea and Taiwan and has aggressively invaded the United States and has now been found in Canada, Switzerland, Germany, Hungary, Greece, Italy and France. To keep this pest out, New Zealand needs your eyes and action. Catch it, call it in. If you see a suspicious looking bug, catch it and call the Ministry for Primary Industries on 0800 80 99 66. Check luggage and mail. If you’re returning to New Zealand from overseas or have received mail from the countries where it is present, check your luggage or mail indoors so you can catch any bugs that may be hiding in your stuff. Spread the word. Tell your friends and family, share this image on your Facebook Page, and post these posters in your offices.